This is a newly published book (well 2010), a first for the author and just a chance spot on Amazon. In all honesty, although horses do form an integral part of the plot, this book is not exclusively a book for horse lovers, but it is a book that all youngsters would benefit from reading. It covers such a wide base from coping with social deprivation, living with alcoholism, low self esteem and neglect to the social divide between these youngsters living this life and those from the same wider communities who have a far more affluent upbringing and want for nothing. This book covers all of these gritty issues and more with tact and remains true to life and most importantly of all is very believable. Declan 'The Hood' and 'Princess' Vicky might be cousins but they are worlds apart. 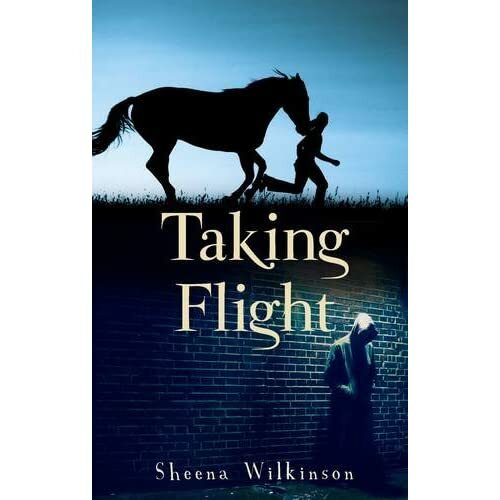 The biggest hardship Vicky has ever dealt with is the breakdown of her parents marriage...however a young stepmother with the same interest in horses and whom Vicky likes very much is not too much a difficulty in her otherwise perfect life. She goes to a good school, has an expensive show jumper (who she has just gotten a place on school SJ team with), has private jumping lessons and her every whim catered for. Declan on the other hand lives a far less charmed life. Social deprivation is very real in Declans world and with an alcoholic Mother, dead Father and previous conviction for joyriding just for starters I don't need to state the obvious. Taking Flight is such an absorbing fast pace read that you are quickly drawn into it and I found it very hard to put down indeed. Declan is an intricate but fascinating character, and a far cry from my own upbringing and experiences (thank goodness if I'm honest) but most of all he's real, sadly very real. There are millions of real Declans out there and Declans story highlights, not only how difficult life can be for these youngsters but also that there can be a different life for them. Anything is possible and life is what you make it regardless of where you come from...this echoes throughout this excellent story. Does sound good tho, something to get your teeth into so to speak. Is it aimed at adults or teens? BTW can you add a poll haffy? I'd say it's a young adult book but you might not want young teens/pre teens reading because of the language/content in places. Point grubber that she is, I am going to be just as bad. Since I can't seem to figure out the quizzes.... I am going to review a few books. Have a stack of pony books just waiting to be shared.